Berto Guerra is Chairman – CEO of Avanzar Interior Technologies GP, LLC., an automotive interiors manufacturing company and Co-Owner of three VBM Auto Group Dealerships, Toyota of Boerne, Nissan of San Marcos and Nissan of NewBraunfels. He retired as Vice President-Legislative and Constituency Affairs for SBC (now AT&T). His responsibilities included oversight of legislative activity in SBC’s US region, PAC (Political Action Committee) solicitation and monitoring, and external education for elected officials, regulators and 3rd Party constituency groups. 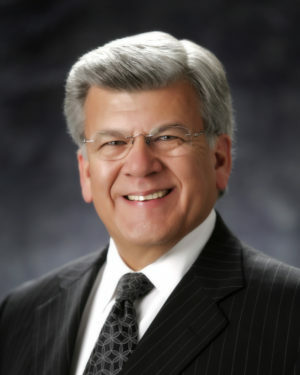 Guerra began his career with Southwestern Bell in 1978 as a business office supervisor. He progressed through a number of positions in customer services and external affairs. Prior to his last assignment, Guerra was Executive Vice President-National Constituency Relations overseeing minority, disabled, education, consumer and senior constituent groups. He also served as Executive Vice President-External Affairs for Southwestern Bell Telephone Company, managing director-corporate development for SBC Communications Inc. and as President of Southwestern Bell International Development. Before joining the SBC family of companies, Guerra served in an owner or manager capacity for various hotel, restaurant and movie theater businesses in Texas. Appointed Chairman of San Antonio Water Systems ( SAWS) 2011 to present. Awarded Distinguished Alumnus Texas State University-2007. Awarded 2007 Business Owner of the year, San Antonio Hispanic Chamber of Commerce. Serves on the UTSA Development Board, from 1998 to present. Currently serves as Vice Chairman of El Centro Del Barrio-CentroMed of San Antonio,1997 to present. Currently serves as Vice Chairman and Organizer of Vantage National Bank. Serves on the Board of Directors of MTC, Inc., (Mi Tierra Café). Serves on the Board of Directors of M.T.C. Real Estate (a real estate development company). Serves on the Board of Trustees for Abilene Christian University, 2002 to present. Serves as Vice Chairman of Board of Trustees for Younglife ( Global), 2005 to present. Serves on the Board of Directors for ¡Adelante! a U.S. Education Leadership Fund, 1998 to present. Serves on the Board of Directors for Conceptual MindWorks Inc., 1995 to present. Serves on the Board of Directors for After School All Stars, 2003 to present. In 1990, President Bush appointed him to the Hispanic Alliance on Free Trade. Served as an Officer and Board Member of TAMACC (Texas Association of Mexican American Chambers of Commerce) between 1980 and 1996. Served as Chairman of the Hispanic Chamber of Commerce of Austin/Travis County 1987 – 1989. Served as a member of The United States Hispanic Chamber of Commerce Senior Executive Council Advisory Board (SECAB) from 1989 to 2007. Served on the Board of Directors for the Congressional Hispanic Caucus Institute thru 2007. Chairman of the Free Trade Alliance Executive Committee of San Antonio, 2003 to 2006. Served as Chairman 2000 for the San Antonio Hispanic Chamber of Commerce. Served on the Advisory Board for Laredo National Bank, 1998 to 2007. Served as a director for Cinemark USA Inc. (third largest theatre company in U.S.), 1990 to 2004. Served as Director for Pizza Mgmt. Inc. ( a Pizza Hut franchisee with over 250 restaurants. ), 1986 to 1992. Owned and operated three family restaurants from 1968 to 1974. Born in Roma, Texas, and raised in Corpus Christi, Guerra received a Bachelor of Applied Arts and Sciences Degree in Interdisciplinary Management from Texas State University in 1984. He also completed the Penn State Executive Management Program in 1991. He and his wife, Tammy, have four children and ten grandchildren.